Nutritional therapy uses nutrition science in the promotion of health and well-being. It is considered to be a complementary therapy so it can be used alongside conventional medicine. 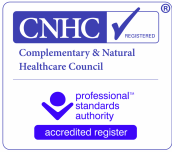 Registered Nutritional Therapists help to identify potential nutritional and lifestyle imbalances and understand how these may contribute to an individual’s symptoms and health concerns. This approach aims to help support the body towards optimal health and vitality. I gained a Master’s degree in Nutritional Therapy with distinction from the University of Worcester. I believe that good nutrition is essential for health and well-being, especially with today’s busy lifestyles. My approach to finding solutions is to address the underlying root causes of problems. Addressing the sources of issues is the best way to achieve positive results. I am committed to working with you to help you to achieve your health goals. I encourage you to take control of your health and make informed choices. My advice is practical and based on the latest scientific and nutritional research. Programmes are personalised to suit individual needs and lifestyle, and include guidance with recipes and meal planning.